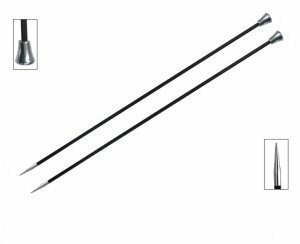 Knitter's Pride Zing Single Pointed Needles and Knitter's Pride Royale Single Pointed Needles are both similar needles: 13.75" / 14" (35cm), straight, and US 9 (5.5mm) US size. Knitter's Pride Royale Single Pointed Needles From $7.62 to $10.89Select options on sale now! Knitter's Pride Basix Single Pointed Needles From $3.64 to $5.20Select options on sale now! Knitter's Pride Nova Cubics Platina Single Point Needles From $4.20 to $6.00Select options on sale now!